Collapsible Plastic Pallet Box - FLC750. 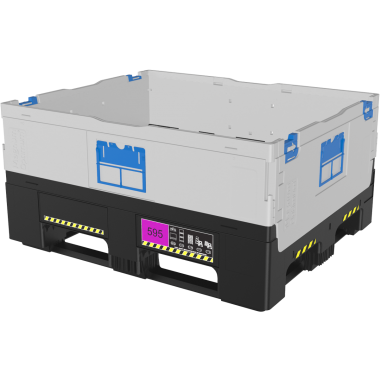 The FLC750 is an industrial quality plastic pallet box designed to completely fold down when not in use. This collapsible pallet box is ideal for saving on storage space and is fitted with 2 runners on its sides and 2 block feet. The folding plastic pallet box can be easily handled on a pallet truck or forklift. Plastic pallet box manufactured from a tough and durable polypropylene material. Collapsible pallet box is able to fold down completely when not in use. Fitted with 2 runners and 2 block feet in the middle, this plastic pallet box can be easily handled on a forklift or pallet truck.